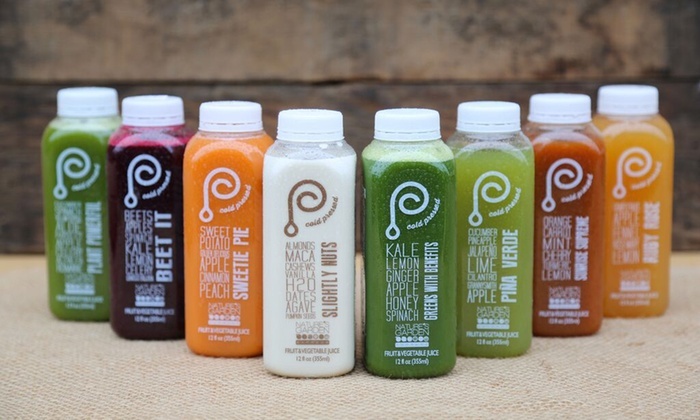 Just because it’s cold outside doesn’t mean that we can’t enjoy the benefits of Cold-Pressed juices. Actually, these beverages are exactly what we need for the winter months where the selection of produce is less and our chances for becoming ill are greater. Our most popular 100% Organic Cold-Pressed juice, Greens with Benefits boasts a delicious and classic combination of flavors: Kale, apple, lemon, ginger with an addition of spinach and a bit of honey for sweetness. Ginger will warm you up from the inside while acting as a potent anti-inflammatory that aids in detoxification and digestion. Kale and spinach are rich in antioxidants, vitamins, and minerals essential to body function; a serving of this juice alone provides 70% of the daily recommended amount of Vitamin A! Honey and lemon provide antibacterial/fungal properties and really help to support immune functioning. The name isn’t lying…with this juice you really do get your greens, with benefits! Ingredients: Kale, Lemon, Ginger, Apple, Honey, Spinach. This may be our most winter season friendly beverage. Grapefruits and apples are staple winter produce items and so is fennel while rosemary and lemon remain available year round. Grapefruit and lemon are rich in Vitamin C and help to cleanse the body and boost immune functioning. For centuries, people have turned to fennel for its digestive benefits; fennel is also rich in Vitamin C, A, Niacin, Folate and minerals like potassium, manganese, calcium, phosphorus, iron, and magnesium. What makes this juice most interesting is the addition of rosemary. This traditionally savory herb improves blood flow and acts as an anti-inflammatory making it fantastic for reducing the effects of migraines and treating pain. Ruby Rose remains a popular favorite of ours and is perfect for getting us going on those early farmers market days! Just Beet It! Beets are another winter staple item that are not only rich in vitamins, minerals, and antioxidants but also help cleanse our body, purify blood, and maintain liver function. Beet It boasts the same benefits associated with lemon, apple, kale, and spinach as previously mentioned. The addition of Ginkgo Biloba makes this beverage different from the rest in our line up of 100% Organic Cold-Pressed juices. Ginkgo Biloba is known to improve memory, concentration, and mental alertness and may provide relief for headaches, sinusitis, and vertigo. So not only does Beet It help our bodies beat the winter blues, but it also brings our brains up to par when feeling foggy from the shock of cold weather. Sounds like a win-win. I cant live without beet it in my life. Ill have to try the other two though.